Situational awareness: The Los Angeles Times has a big feature on the looming EPA moves to weaken Obama-era fuel efficiency standards, as we've discussed here and here. Dear Ohio: Join Axios' Mike Allen at The Ohio State University Monday for a discussion on the Future of Work with entrepreneur Mark Cuban, Governor John Kasich, and our own Jim VandeHei. To RSVP click here. Financially struggling FirstEnergy Corp. wants Energy Secretary Rick Perry to make sweeping use of emergency powers to keep the companies' coal-fired and nuclear plants running and guarantee higher revenues. Why it matters: It's a new front in the intense policy and political fight over power plants facing heavy pressure from cheap natural gas, renewables, and stagnant demand. It forces a big question, which is how far the Trump administration will go to help coal and nuclear plants at risk of closing. Why this sounds familiar: The Federal Energy Regulatory Commission in January rejected Perry's push for new power market rules that would aid companies with coal and nuclear plants in the Midwest and mid-Atlantic. The gang is all here: It drew instant pushback from the spectrum of interests that attacked Perry's FERC move, ranging from the American Petroleum Institute to the Sierra Club. PJM Interconnection, the regional market operator, also attacked the request, even as PJM weighs its own market pricing changes. PJM contests FirstEnergy's argument that past and looming closures constitute an emergency that puts the region's "system resiliency" at risk. The company's filing says PJM has shown "little urgency." One level deeper: FirstEnergy wants DOE to aggressively alter market conditions in PJM, which covers all or parts of 13 states and contains dozens of coal and nuclear plants. Their filing says DOE should order PJM to ensure plants are compensated for the "full benefits they provide to energy markets and the public at large, including fuel security and diversity." ICYMI: On Wednesday, FirstEnergy said it plans to shut down three nuclear plants in the coming years. The intrigue: One interesting thing about FirstEnergy's request is that it's asking for an unusually aggressive use of DOE's emergency authority under the Federal Power Act. In the past, these "must run" powers have been used sparingly and in very targeted circumstances. DOE has a list of past cases here. The department said yesterday that the request would go through a "standard review process." "Section 202(c) of the Federal Power Act gives DOE authority to order temporary actions in times of war or emergency. The authority is not suited to imposing multi-year structural changes to an entire region. Were DOE to use the authority in that way, it would face a steep, uphill fight in the courts." Crystal ball: I chatted with Sue Tierney, a senior DOE official under Bill Clinton. She similarly said that what FirstEnergy wants would be an atypical use of the Federal Power Act. But Tierney also said that Perry's unsuccessful push for FERC to write new rules suggests that he may agree with FirstEnergy. "Given that the secretary has already demonstrated his willingness to make an extraordinary request for action on behalf of these plants, it would not shock me to see the secretary approve this request,” she said. Be smart: Utility Dive has an in-depth look at the filing and its implications. Bidding big: Per the New York Times, "Exxon Mobil and other oil companies opened their wallets at an offshore oil auction in Brazil on Thursday in a sign that the industry was stepping back into the deepwater drilling business." The oil giant and its partners offered eight winning bids totaling 640,000 acres, including one bid of $848 million. BP, Shell and Chevron were among the other companies snapping up acreage, and Reuters reports that the sale netted Brazil's government $2.4 billion. My thought bubble: The auction comes just a week after a big Interior Department lease sale in the Gulf of Mexico brought in just $125 million in total winning bids. 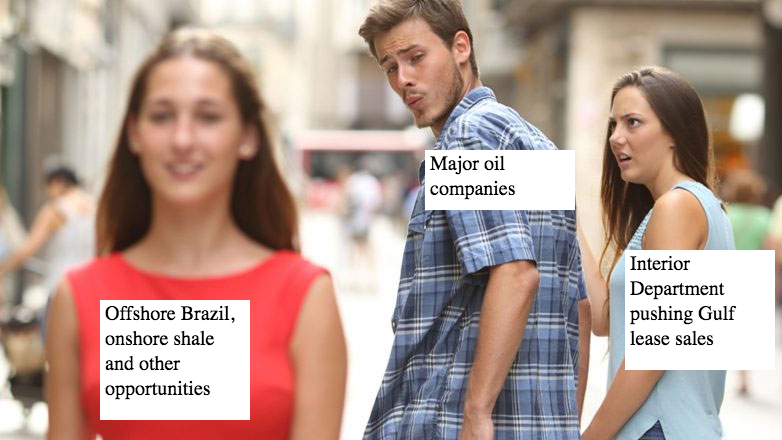 The contrast shows how, despite the Interior Department's promotion of drilling on U.S. public lands and waters, companies have a wealth of other attractive options like offshore Brazil and onshore shale plays that are largely on state and private lands in Texas and elsewhere. Note: That's basically my point in the silly meme above. I'll see myself out. An updated analysis from the Rhodium Group consultancy confirms there's a slowdown in the decline of U.S. energy-related carbon emissions. By the numbers: These emissions fell by 0.66% last year, which they note is half their average rate from 2005 to 2016, when emissions fell by a total of 13.4%, thanks largely to slow energy demand growth plus gas and renewables shoving coal aside in electricity markets. 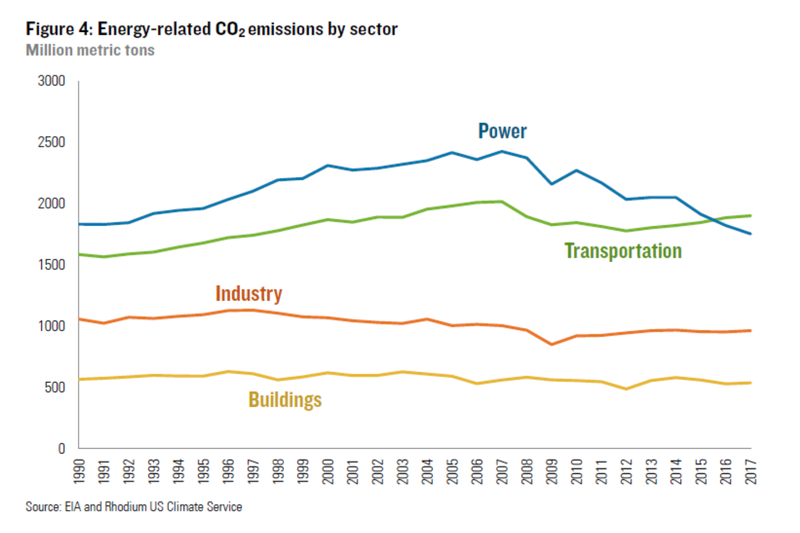 Why it matters: The chart above shows one reason why progress has slowed, which is that wringing carbon out of the transportation sector, as opposed to electricity, is proving a tougher nut to crack. "After a pause following the Great Recession, starting in 2012 vehicle usage in the US once again began to increase. Total vehicle miles traveled in the US increased 1.2% in 2017." "That’s a slower rate of growth than in 2015 and 2016, but when combined with flattening progress on fuel economy, it was enough to result in a modest emissions increase." Electrifying the gig economy: A new Rocky Mountain Institute report explores the estimated cost savings for drivers with "transportation network companies" (TNCs) like Uber and Lyft who purchase or rent electric vehicles. Why it matters: Driving for ride-sharing services is a growing employment sector, and more broadly, the forecasted expansion of electric vehicle deployment is connected in part to their use in shared mobility and autonomous applications. What they found: Despite generally higher upfront costs of EVs, highly active TNC drivers, who puts lots of miles on their cars, can see substantial benefits thanks to lower maintenance costs and not buying gasoline. "Based on our calculations, full-time TNC drivers working 50 hours a week can save an average of $5,200 per year in total vehicle expenses with an EV as compared to a typical gas vehicle," the report states. Check out the chart above: About half that savings comes in avoided fuel costs, and the other half from lower maintenance needs. Exxon: As my colleague Khorri Atkinson noted in the Axios stream, a federal judge in New York Thursday dismissed a lawsuit by ExxonMobil seeking to halt a probe by New York and Massachusetts into whether the oil and gas giant had lied to investors and the public about its knowledge of climate change. The company had sued the states in 2016 after they subpoenaed documents regarding Exxon's research into fossil fuels' role in climate change. Why it matters, per Axios’ Amy Harder: This move likely ensures there will eventually be discovery in the lawsuit where Exxon documents are disclosed, which would shed a lot of light — and headlines — on what Exxon really knew about climate change over the past decades. The AP reports that Exxon says it's reviewing the ruling and evaluating its next steps. Shell: The Wall Street Journal has an informative feature about the company's moves in the power and EV space, noting the oil-and-gas behemoth has a "long-term plan to marry its huge natural-gas output with a futuristic utility business." Back to Exxon: Via AP, "An anti-corruption group says Exxon Mobil bought rights to drill in an area off the coast of West Africa despite its concerns about possible corruption." Tesla: The company's rough patch got rougher still with the news, via Bloomberg, that Tesla is "recalling all Model S cars built before April 2016 to retrofit a power-steering component as the company caps its worst one-month performance in the stock market since December 2010." The recall affects roughly 123,000 cars worldwide, they report. One more thing about the FirstEnergy request: The Energy Department provided some food for thought yesterday when Perry's Twitter account "liked" a Bloomberg reporter's tweet about the company's request. Yes, but: DOE tells Axios that it's not what it appears. "This was human error, not an endorsement from the Secretary. A staffer on the DOE digital team accidentally clicked 'like' on the post — there is nothing more to the story," DOE spokeswoman Shaylyn Hynes said.